Manufacturer: Lubriplate Div., Fiske Brothers Refining Co.
An NLGI Grade No. 2 lithium grease. Excellent for multi-purpose, general greasing. Anti-wear/Extreme pressure, water resistant. Workable 0 F to 380 F.
An NLGI Grade No. 2 aluminum complex grease. For industrial or construction applications under adverse conditions. Workable -10 F to 560 F.
Lithium grease, NLGI Grade No. 2. An excellent wheel bearing and chassis grease. Workable -25 F to 400 F.
A lithium, polymer for heavy-duty applications on trucks, construction equipment NJGI Grade No. 2. Workable -15 F to 425 F.
Very tacky, moly, grease. Excellent on heavy construction equipment. Will not wash out. NLGI Grade No. 2. Workable range from 0 F to 450 F. Very popular with construction maintenance personnel. NLGI Grade No. 1, workable temperature range from -30F to 275F. 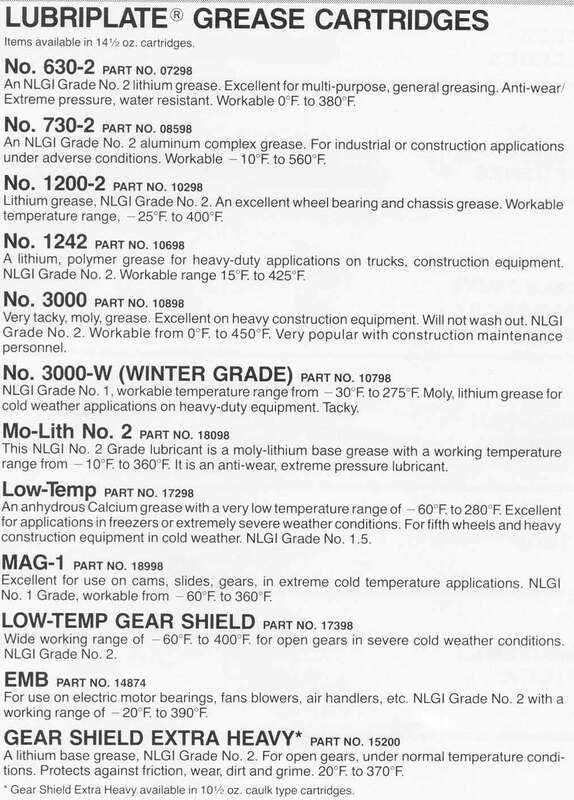 Moly, lithium grease for cold weather applications on heavy-duty equipment. Tacky. This NLGI No. 2 lubricant is a moly-lithium base grease with a working temperature range from -10 F to 360 F. It is an anti-wear, extreme pressure lubricant. An anhydrous Calcium grease with a very low temperature range of -60 F to 280 F. Excellent for applications in freezers or extremely severe weather conditions. For fifth wheels and heavy construction equipment in cold weather. NLGI Grade No. 1.5. Excellent for use on cams, slides, gears, in extreme cold temperature applications. NLGI No. 1 Grade, workable from 60 F to 360 F.
Wide working range of -60 F to 400 F. for open gears in severe cold weather conditions. NLGI Grade No. 2. For use on electric motor bearings, fans blowers, air handlers, etc. NLGI Grade No. 2 with a working range of -20F to 390F. A lithium base grease, NLGI Grade No. 2. For open gears, under normal temperature conditions. Protects against friction, wear, dirt, and grime. 20F to 370F. * Gear Shield Extra Heavy available in 10 1/2 oz. caulk type cartridges.